Where would we be without the trusty old lighthouse? I hate to think. 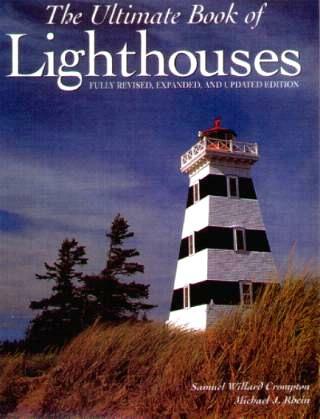 This newly updated, revised, and expanded edition offers us a rare opportunity to see a variety of lighthouses along the North American coastlines, among others. There is a fascinating historical introduction, from the first known lighthouse, Pharos at Alexandria in Egypt, to ones built along the Mediterranean and Europe, and subsequently along the American shores. They started the early illumination by using candles and finally ended up using electricity. This book is impeccably illustrated with incredible photographs, and it would proudly make it to the top of your coffee table reading pile. I had no idea that there were so many styles of lighthouses, so discovering some "new" shapes, was enlightening and surprising. They are not all the familiar conical shape so lighthouses like Battery Point at Crescent City, California; Cape Elizabeth at Portland, Maine; Rear Range Light at Bailey's Harbor, Wisconsin; and Port Sanilac Light, Michigan, were just plain gorgeous. They are also not all situated along the sea, but also on the shores of lakes, inlets and harbors, and riverbanks. Hence, lighthouses can be found on Lake Michigan (see page 204) and check out Pomham Rocks Light at East Providence, Rhode Island. The Ultimate Book of LIGHTHOUSES may be purchased and/or ordered through your local bookstore. Conclusion - An excellent gift for anyone's coffee table.